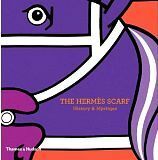 An entire book about Hermès scarves - how delicious! As artistic director Pierre-Alexis Dumas says in his introduction, the Hermès scarf is "a landmark in the history of style", one where "every detail counts, every color has a name and every scarf has a meaning". I have to declare right away that The Hermès Scarf: History & Mystique does not cover every Hermès scarf ever produced. But at over 2000 designs and counting, a book picturing or even listing every scarf would run to several volumes, so I guess Nadine Coleno and Thames & Hudson can be excused for instead producing this smaller (but still substantial at 304 large format pages) book. The book takes the form of several initial essays, with the bulk of the pages devoted to full page color images of the scarves. With around 150 scarves featured, this can only offer an overview, but oh, what an overview it is! Even a quick glance through the images impresses - demonstrating just how varied and playful is the art form known as the Hermès scarf. Frustratingly, none of these beautiful full page scarf illustrations have captions, forcing the reader to constantly skip between the illustrations and annotated thumbnail images at the back of the book. The thumbnails are referenced with page numbers, however as no corresponding page number are permitted to sully the scarf images this is completely unhelpful. The choice of scarves is sumptuous, but relies heavily on the more recent designs, particularly those from the 1990s. I would have liked to see more of the classic earlier designs. An interesting aspect of the book is that several scarves are pictured alongside the objets that inspired the design. So we see canes and riding tack, and one of the keys (in fact a key to the doors of Notre Dame!) that is incorporated into the starburst design of Les Clefs. These objets belong to a collection of some 10,000 items created by Émile Hermès. Also from this collection is a board game dating to the 1830s called Jeu des Omnibus et Dames Blanches, the inspiration for the scarf of the same name, which was of course the very first Hermès scarf of 1937. The color plates incorporate a number of acetate overlays, in an attempt to demonstrate how the screen printing process works. The scarf featured is Pani La Shar Pawnee, a particularly complex design, and I don't find that the overlays quite work. This design has a large number of colors, meaning that - confusingly - several colors are shown on each overlay. Similarly, the division of scarves diagonally, into quarters, or into several strips to showcase different colourways on a single scarf, seems to me simply to detract from the scarf. Much better, as is done in a few examples, to place the full scarves side by side in different colorways to demonstrate how dramatically each colorway can change a single design. The text, at least on first reading, is not an easy read. It is academic, philosophical and poetic by turns, and names and ideas dart across the pages. Some passages border on the incoherent. The text is translated from the French, and therein, I suspect, lies the problem. Although perfectly fluent and grammatical, I suspect something of the meaning of the texts has been lost in translation. Having said that, once armed with a basic knowledge of the Hermès family and their designers, I found a second reading much more rewarding. An additional complaint, however, is that numerous scarf designs are mentioned but not illustrated... reducing me to doing Google image searches to view them. The author notes that novelist Colette wore her favorite Ex-Libris scarf as a huge bow tie. That would be something to see! But again there is no image. Despite the claim of the book's title, the history of the Hermès Company and the Hermès brand is only lightly touched upon. There is some interesting detail on the Hermès logo (or 'house emblem', as it is called), including an image of the equestrian drawing from which it was derived. Tantalizingly, the author mentions that Hermès sold 'abstract and geometric silk scarves' as early as the 1920s, created for the company by a 'quality supplier'. The designs were apparently not considered satisfactory, therefore paving the way for the first true Hermès scarf. The author stresses that an Hermès scarf is never the work of a single individual: it famously takes more than 250 people to create a scarf. I wanted to know more of these people, the weavers, colorists and printers, as well as the designers. Who are they, what is the creative process, and what are their inspirations? Names flit through the pages, but we never 'meet them'. We do however learn that the meticulous work of breaking a design down into the 20 or more individual color screens required for printing can take six months. Hermès scarf designs incorporate up to 49 colors, each requiring a separate screen to be placed on the silk during the printing process. One of the essays talks in particular about color, explaining that "coloring a scarf is like setting it to music". Hermès designers work with 40 base colors, which, with tints and combinations, give a palette of over 70,000 color tones. A design must be strong enough to take a variety of colorways (10 colorways per scarf is usual), "to play a multitude of roles while remaining true to itself". The colorist's job is not an easy one - Hermès, being a truly international brand, must strive to accommodate every taste, and offer designs and colors to please women (and men) of all colorings, in every corner of the globe. We learn that during 'color session' each scarf is laid on the floor, to allow staff to 'judge balance and composition'. An archive photo of this process shows the Chairman and CEO wearing street shoes and standing on several scarves. Quelle horreur! "The silk for Hermès scarves is sourced uniquely from a Brazilian silk farm. The silk has, for the last half-century, been woven for Hermès by Établissements Perrin". How tantalizing! And how fascinating it would be to read more about this... together with preliminary sketches, color ideas, and more, much more, about the screen printing process. But perhaps I am asking too much. After all, Hermès - more than perhaps any other luxury brand - understands the true value of 'mystique'! 19th century canes, sticks and crops from the Émile Hermès Collection. See also my list of other Books on the History of Scarves. If you're interested in the history of scarves see my articles on Scarves in History.